The night before the Star Wars Half Marathon I did something I've never done before. I know that switching up your routine before or during a race is (in theory) never a good idea but I like to test myself and I've never had an issue. So the night before the Star Wars Half, after an amazing dinner of "Walt's Favorite" Homemade Meatloaf at Carnation Cafe, I left Disneyland at about 7:00 pm. I went back to my hotel room and I did the unimaginable. I slept. For 7 hours. Shocking, I know. Typically I shut down the parks and sleep maybe an hour or 2 before a half marathon, but this time I came back to the room and packed my suitcase, my new Disney treasures and my toiletries. I called home to check-in on the family (who were shocked I was in my room knowing that John Stamos was at Disneyland) and about 5 minutes after the first "boom" of the fireworks, I was out. I needed it. My feet were killing me and my mind was in knots over how my knees would handle the 13.1 miles. All of my race gear was ready so that I could sleep in until about 3:45 am. 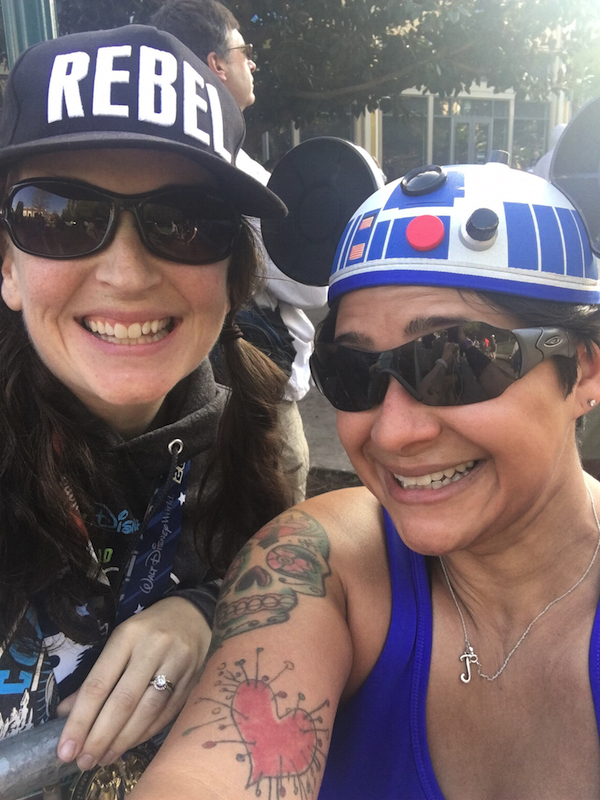 My race costume for the half marathon was inspired by my childhood favorite, R2-D2. I paired a blue tech tank with a homemade silver sparkle skirt and topped it off with my R2-D2 Mickey ears. Blue CEP Compression socks and navy Under Armour shorts completed the look while my new Garmin and beloved shoes kept me in check. The next morning I woke up feeling well-rested and pretty good about the course. Getting through security for the 5K and 10K was a breeze. Both mornings I stopped at Starbucks in the Downtown Disney District for coffee, breakfast and a final restroom break. On this morning, however, I lost track of time. I was busy worrying about everything and I didn't even leave Starbucks until close to 5:00 am. Then I stopped to use the restroom, then I stopped to take photos...yada, yada, yada. By the time I got to security the line was really long and it was 10 after 5. Luckily I stayed alert and shifted into the line that moved the fastest. The walk to the corrals was a little tougher as people were moving slowly, if at all. They were taking pictures of the start line not realizing that the race was kinda starting. I did make it on time and a few minutes after I started moving my phone began blowing up. My friends were texting to tell me Star Wars had just tweeted this pic of me. WOW! I stopped dead in my tracks. STAR WARS TWEETED A PHOTO OF ME! Once again the first character was stationed backstage but I kept running, err walking, by. I was super nervous about stopping for photos because I had to stay on a brisk walk pace for the entire race in order to finish without being swept. As we entered Tomorrowland, I snapped photos of the Stormtroopers and Chewbacca as I breezed on by. Chewbacca made it out to all three races this weekend which was pretty awesome! I walked from it's a small world through Frontierland and stopped at the Mark Twain Riverboat dock to say good morning to the awesome Cast Members who cheer us on so early in the morning. We ran through the castle and into Fantasyland where the Mad Tea Party was happening. I LOVE the lighting in this part of the park. 10 minutes later I was inside Disney California Adventure and standing in front of beautiful Paradise Pier. I know I said I wasn't going to stop for any character photos, but my pace was just under or just at 15 mm and I decided to see my little friend. After I took my photo and walked away, the photographer called me back and asked me if I'd kiss the droid. Of course I said yes! The wait was long enough to bump my pace up to 19 mm so I shuffled hard as I excited Disney California Adventure. Then I heard Lisa call my name and I stopped to say hi and get a photo of us together. A runner herself, she's an awesome gal, a fab Cast Member and a great face to see on the course! I'm so happy I got to see her. From there it was time to hit the streets of Anaheim. 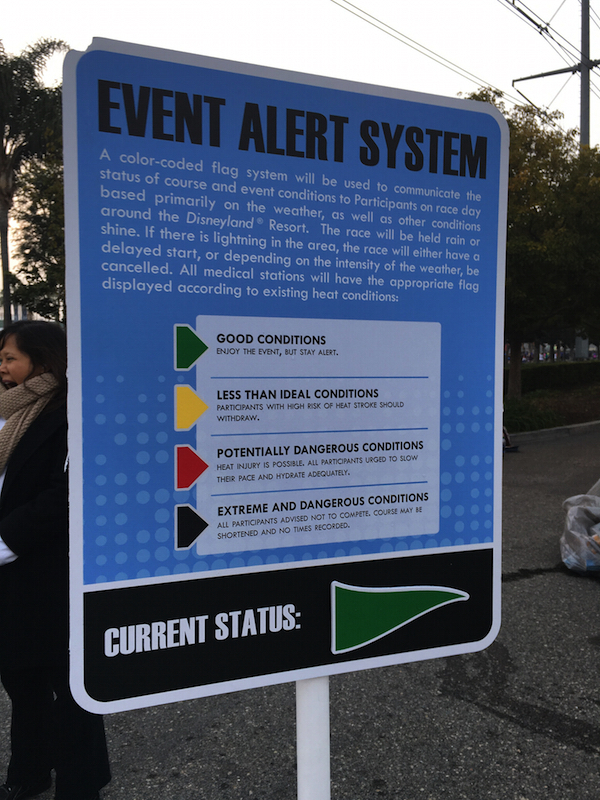 On our way out of the park I saw this Event Alert System sign I'd never seen before. Just like the sign says, the current status was good! Hella good if you're from Nor Cal! I was feeling great and as long as I kept moving my average pace continued to drop. On Harbor I ran into the #WeRunSocial crew who were out cheering for all of us runners. So awesome to see your peeps on the course! I love that people can be on the streets cheering during Disneyland races. Lots of bands and cheerleaders also showed us love on the course. I'm a band geek and a cheer mom, so of course I LOVE this stuff! Someone needs to tell the Jedi that I found Yoda, and he's in Garden Grove. Tons of runners stopped for a photo with the OG Jedi Master. Cosplayers everywhere. That's a great perk to this race. 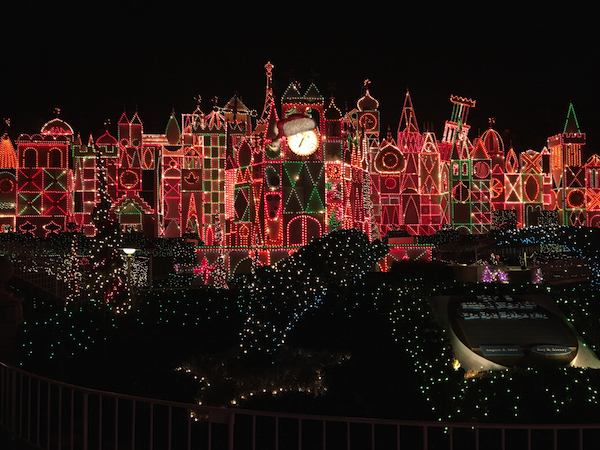 If you don't see the characters you'd like to see in the park or you didn't want to wait in a long line - don't fret. These guys and gals are here to save the day. By mile 10 I was tired of walking. I was thankful for the weather, I was loving the course, but my legs just wanted to run and I did catch myself running for 10-15 seconds then walking. But my friend Tim pointed out that my jogging pace was the same as my walking pace so I cut that out pretty quickly. My friend Emelia kept sending me encouraging text messages when I felt like I'd never reach the finish line. The last two miles seemed like 4 and I was worried about getting back to the hotel in time to check out. She kept reassuring me and then casually mentioned she was at mile 13 waiting for me. That lit a fire under my feet and I picked up the pace! I couldn't wait to see her. On my way towards the mile 13 sign, I also saw my friend James. I cannot tell you how great it feels to have your friends wait for you to run by or call your name or take a photo. When you are that mentally and physically exhausted - it means everything. At last, 13.1 was done. I need to be sure you all know how much the texts, the Tweets, the hugs on the course and the Instagram and Facebook messages meant to me during this race. THANK YOU. THIS HAPPENED BECAUSE OF YOU. Another huge thanks to all the VoluntEARS who make these races fun, safe and enjoyable! Being a VoluntEAR at a runDisney race is on my bucket list. Would I run this race again? YES! Even after the recent runDisney price increases? YES! 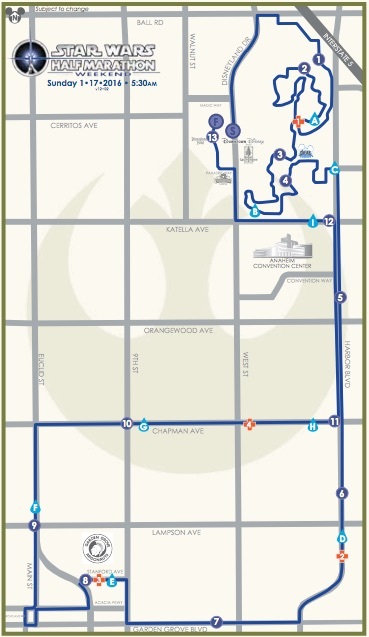 This particular race weekend is my favorite of all the runDisney races and I will run the Disneyland Rebel Challenge for as long as I can, no matter how much I have to pay. Since I pay for my own races, multiple runDisney races throughout the same calendar year will no longer be financially possible for me. I am a working mother with a child in college and real budget constraints. I am also a wanderlust, so I crave new things and certainly won't make repeat race decisions based on FOMO or other such nonsense. I will, however, continue to enjoy every magical mile of this - my favorite race in the runDisney galaxy - until my legs give out. You can bet on that! I think by now everyone saw my reaction to the price hike (there's a Tracy Morgan GIF for every emotion because he is the best). The reality is, the experiences and relationships I've made running these Disney races are priceless and I will still continue to recommend runDisney to new runners & Disney fans. It's a family race vacation experience that is worth saving for, and I support that idea especially if it is going to inspire a sedentary person to become a healthier version of themselves. 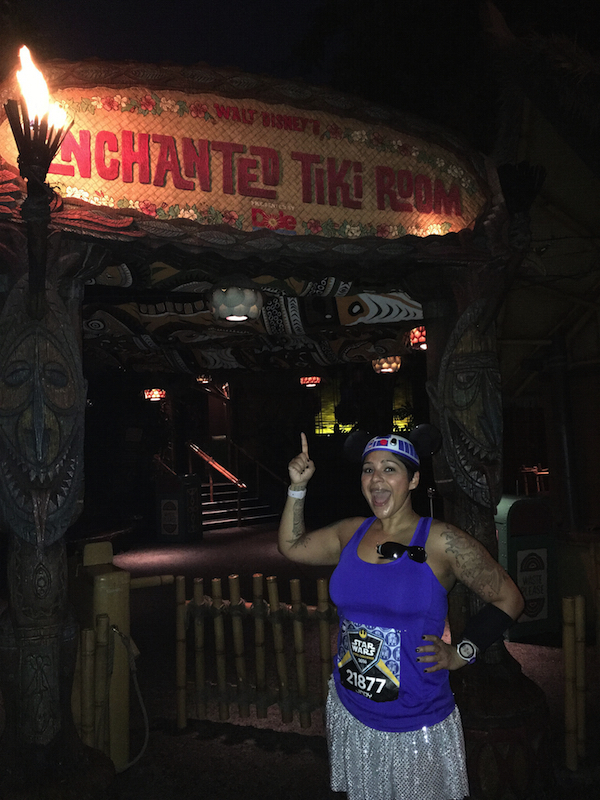 I am behind self-improvement and better health 100%, and that is exactly what runDisney did for me. 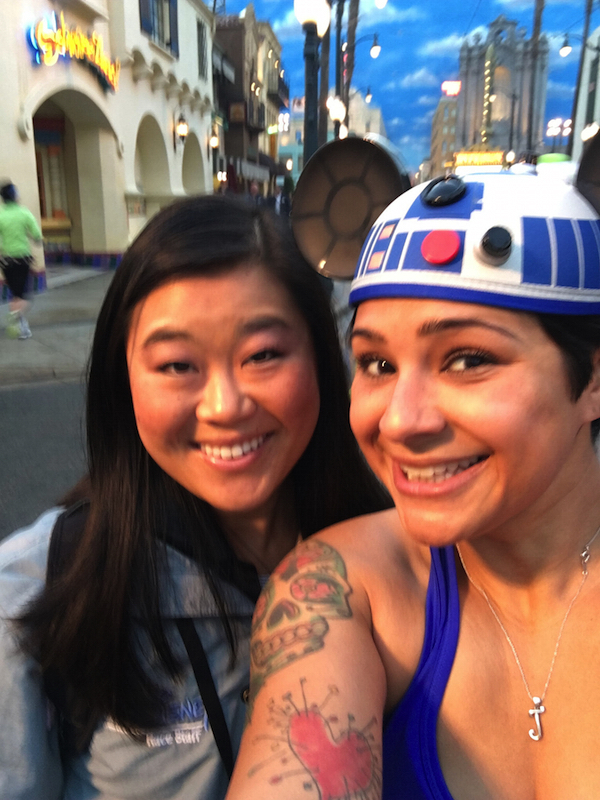 runDisney introduced me to running and inspired me to push and challenge myself. I am forever grateful to runDisney for the inspiration and will continue to run other races locally and throughout the country now that I am a better, more experienced runner. So my friends, I will see you at the Dark Side Challenge in April at Walt Disney World! I'm already registered to run that challenge and can't wait to earn those epic medals. How was your Rebel Challenge experience? How do you feel about the race rate increases?